I bet ya'll were expecting some bling, bling rims. I wanted to post apicture side by side to show the difference in color. I've been waiting for a pair of 17x9 bullits for 4 weeks now and finally they came today. I was curious to see how much they weigh, so I stood on the bathroom scale with them and got 22lbs the first time and 23 the second time. That's what the stock 17x8's are suppose to weigh. The bad news is they are made in CHINA! So I could die my first pass down the track. Will my stock center caps fit on these rims? And if so is there an easy way to get the center caps out or do you just bang'm out. 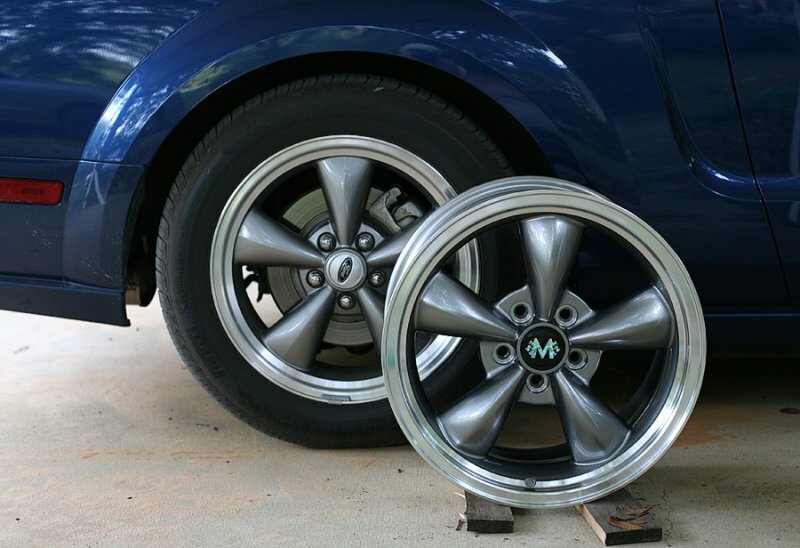 By the way, 2 17x9 rims along with two 275/50/17 tires will fit in the back of the car with the seats folded down. I'm getting them mounted and balanced tomorrow. RE: finally got my rims! It doesn't look like the center caps would work....but it's easy enough to find out...yep, just bang em out! nice.... i like it.... great color match too.. once you get that center cap changed out it will look almost stock..
wait are those just to replce the rears? LMFAO!!!!!!! Cardboard, that's great! 18's in the back would be cool, but not cool for ET's, these are for the track mainly. Yes, just for drag radials, just for the track. If I have enough power in the future, I may run these all the time with drag radials. I hope that the Chinese are better at producing wheels than they are at pet food,tooth paste, seafood, and those tires that have been failing. (lol) I think they will be fine, and they're a good match. if your interested here is the CNN article I was talking about.. I could not believe it either.. I'm surprised the 275/50s are too low a profile for your wheels. I used my stock 235/55s on new 17" x 9" deepdish cobra r wheels and they make a perfect fit in the wheel wells (I've got eiback prokits). I'm thinking the biggist rubber I can use is 255/50s (to get the same hight I got). Quick Reply: finally got my rims!